Place the salmon to fit snugly in a deep-sided baking dish. Place the beetroot, juice, garlic, lemon rind, juniper, salt, pepper and half the tarragon in a blender and blend until smooth. Pour the mixture over the salmon, ensuring the salmon is submerged. Cover with plastic wrap and refrigerate for 3 hours. Preheat oven to 240°C (475°F). Line a large baking tray with non-stick baking paper. Remove the salmon from the dish, wipe off any excess marinade and set aside, skin-side down, on the tray. Reserve ½ cup (125ml) of the beetroot mixture and strain into a small saucepan. Place over medium heat. Add the sugar and vinegar, stir to combine and bring to the boil. Cook for 10 minutes or until syrupy. 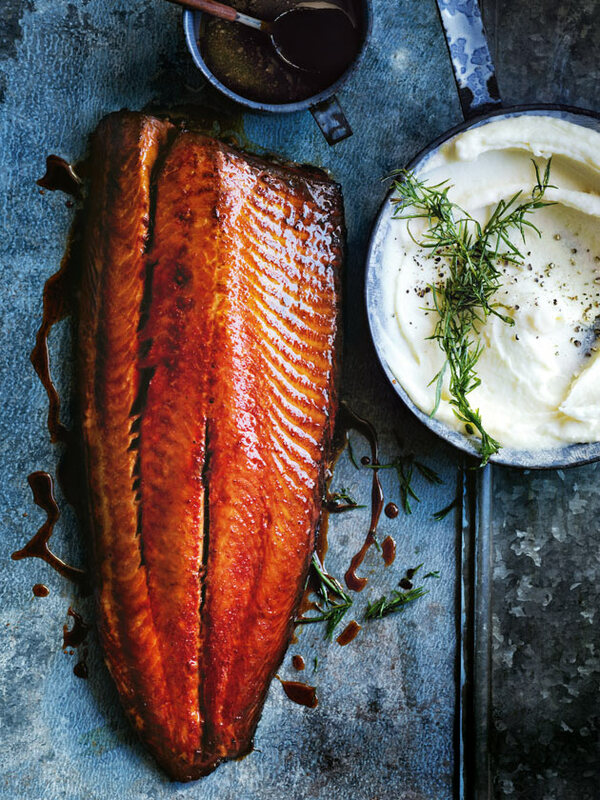 Roast the salmon, brushing every 10 minutes with the beetroot glaze, for 30 minutes or until dark golden. To make the horseradish mash, place the potato in a medium saucepan of cold, salted water over high heat. Bring to the boil and cook for 8 minutes or until tender. Drain and return to the pan. Add the cream, horseradish and salt and mash until smooth. + If you can’t find fresh horseradish, you can substitute with grated horseradish (available in a jar from the supermarket). Is the beetroot cooked first? Or do you put it in the blender raw???? That’s one tough blender!